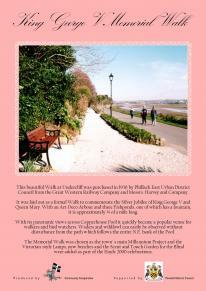 The Memorial Walk was closed in 2012 to motor traffic on Sundays. This has proved very successful and on most Sundays it is filled with families, adults and children enjoying the beautiful natural environment and a safe place for children to cycle and use their skateboards. The question has been raised as to whether additional closures might be possible: Bank Holidays, Saturdays or every day. If you are not surveyed to death, there is another one you might have a view on - the King George V Memorial Walk - it is only 4 questions. This has been closed on Sundays for 4 years and this has proved very successful. A number of people have asked if it could also be closed on Bank Holidays and some have said that it should be closed to motor traffic every day! Of course, it will never be closed for access to or by residents on the Walk or for emergency vehicles or service vehicles (such as the gardeners and the bin men/women). This is an informal survey by me as councillor for the North Ward and just seeks to see whether there really is a strong desire for change. If there is, we will need to go through a more formal process. Tim Eustace I'd also support a return to dogs having to be on leads for the length of the Walk. It's been a long time since those signs disappeared, but it would be useful when running. Tim Eustace True, but in my experience they're often not under control and drivers don't stick to 20mph. Julie MacDonald Maybe it's the drivers that should be targeted then? I drive along daily and to be honest anything between 10mph and 15mph is ample. Deborah Leth It is actually the law that dogs stay on a lead in a public place. Tim Eustace My own dog is still young and can be a bit over excitable with other dogs, children on bikes, runners etc so I keep her on the lead down the walk. Many others don't( in my experience of running down there). Deborah Leth I keep my bullys on leads,one is reactive to others and does not like dogs in her face,I keep mine away from others but I expect others to do the same and they do not,been attacked a few times walking the walk ,so many irresponsible owners who just have no control. Trevor Maxfield This has been tried so many times. It's a ROAD with a large footpath that is the Walk, use it as such. Chris Hollow Which ever way it turns out I hope it's better than the cycle path on the causeway that hardly any cyclists actually use, just saying ?? David Pascoe It would help if there was some signage to let people know that it's a cycle path. You'd never know just by looking at it. Rick Cornwall It is and always has been (since the railway sold it) a WALK. It's only been used by significant motor traffic in fairly recent times. Let's keep it as it was meant to be - a WALK - at least on Sundays, hopefully Bank Holidays and if there's a clear opinion then perhaps Saturdays as well. Graham Coad Incorrect Rick, it has always been a ROAD, only the old Railway line was originally purchased by Hayle in 1936 and the footpath and flowerbeds built on it as "The King George V Memorial Walk"
The road there was called "Undercliff" and the road and land on which the swimming pool was built were only purchased by Hayle in 1982. Stella Robbins Correct Graham, the footpath is the Walk and the road is a Road and has always been a road. A very rough road for many years but still a road. Tania Grey The clue is in it's name, wouldn't it be called Memorial ROAD otherwise? Graham Coad it has always been a ROAD, only the old Railway line was originally purchased by Hayle in 1936 and the footpath and flowerbeds built on it as "The King George V Memorial Walk"
The railtrack ran along the bit that is now the footpath and flowerbeds, you can see that at the eastern end where the old track line continues across Wilson's Pool. Rick Cornwall Might've been called "Railway Road" or even "Great Western Walk" as it used to be the way the railway came into Hayle backalong. Trevor Maxfield The footpath is the Walk. How much space do dog walkers want? Take them up on the Towan's. Unfortunately the decision on this is going to be made by people that don't live in the immediate area. I suspect that the person leading this campaign is one of our Councillors who let's his dogs wander all over the place. Take the children to the Rec, the Plantation, the Towan's, the Beach, Football club, Rugby club,Cricket club, to name but a few. Where did all you older ones play? Trevor Maxfield Did you ever get knocked down? Geraldine Trafford Garraway It should be available for "all" to use. I use the walk twice a day and have never come across anything that would involve implementing yet more bans or signs. Tania Grey Why do you have such an issue with dogs Trevor Maxfield, are you regularly attacked by one? You will find that the majority of us keep our dogs under control and make a point to clean up their mess and any other we find, so to answer you as a dog walker who is responsible and respectful I want every single space that is available to me . Trevor Maxfield Don't have an issue with dogs, have an issue with closing the road. But I do have an issue with people letting their dogs wander all over people's gardens, in particular someone who should know better. Tim Eustace I used to play there and also didn't get knocked down, mostly because there was hardly ever any motor traffic there. Deborah Leth I am not opposed to the road being closed,but i think the dogs should be on leads,its chaos down there on Sundays, people let their dogs off lead and many have no recall it makes life hard for those with dogs who do not like to mix with others,and this even happens in the week also.please can we have a dogs on lead sign,as the law states that dogs should be on a lead in a public place and the walk is a public place. Rosie Reast I don't think it should be closed all the time, but we love taking the kids there on Sundays. This year my son has just learned to ride his bike along the walk and its wonderful to have a safe space for him to practice on without risk of cars or (more to the point) him knocking people over. Chris Stumbles Yes, I fully agree with that. Permanant closure is the best option. David Twigg I reckon time and money would be better spent on traffic calming in Phillack too much speed being carried along with a lack of manners. Soneoes gonna have a bad one pretty soon, I don't want it to be me. Tim Eustace Good point, thee is on fact a need for people to drive along there as it gives Phillack residents a useful way to the main road, avoiding what is probably Hayle's busiest junction. Especially in Summer. Roger Thomas It is a valuable link for people who live and work in Phillack. It is a nightmare trying to pull out of Lethlean lane at the best of times but when you get all the Recreation ground cars parked along the roadside In the summer it becomes even worse. Without the option of the walk it will impact heavily on that end of town too. Fi Ishmael I would like dogs on leads too! !